Learn about the Wavefront VMware PKS (Archived) Integration. VMware PKS enables operators to provision, operate, and manage enterprise-grade Kubernetes clusters on Pivotal Cloud Foundry (PCF). This integration uses Heapster, a collector agent that runs natively in Kubernetes and kube-state-metrics, a simple service that listens to the Kubernetes API server and generates metrics. The integration collects detailed metrics about the containers, namespaces, nodes, pods, deployments, services and the cluster itself and sends them to a Wavefront. See VMware PKS Integration Details for a list of predefined alerts, an architecture overview, and troubleshooting info. 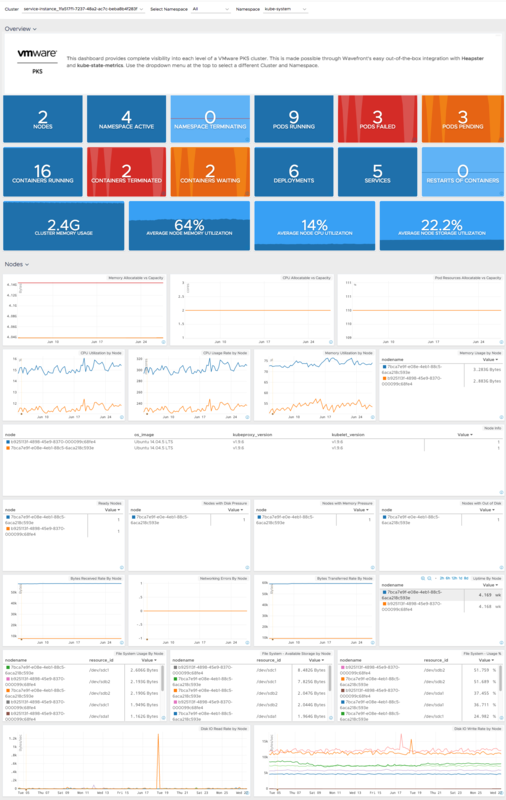 This integration explains how to configure VMware PKS monitoring with Wavefront from the PKS tile present in PCF Ops Manager. After you’ve completed the integration setup, you can use Wavefront to monitor the VMware PKS cluster. In addition to setting up the metrics flow, this integration also installs a dashboard. Here’s a preview of Overview and Nodes section of the dashboard. Supported Version: VMware PKS 1.1, 1.2 and 1.3. See the Documentation for details. Note: For VMware PKS 1.4 and later versions, see the VMware PKS integration. Log in to PCF Ops Manager and click the Pivotal Container Service tile in Installation Dashboard. Under the Settings tab, click Monitoring. Click the Errands tab and enable the Create pre-defined Wavefront alerts errand and the Delete pre-defined Wavefront alerts errand. Click Save to save the Wavefront configuration. Navigate back to the Installation dashboard and click Apply Changes. Wavefront monitoring will be active for any cluster that is created after you have saved the configuration settings and applied the changes.